3:00 PM CT Saturday on ESPN our Boys in Blue host Huggie Bear's WVU Mountaineers in venerable Allen Fieldhouse. Jon Sciambi will do the play-by-play, while Fran Fraschila provides the analysis. No word on who will be the courtside reporter (Holly? Hopefully?). Our Jayhawks look to make amends for their late game collapse in Morgantown earlier this year and try to stay within striking distance of KSU. They are shooting for an AY2018-19 record of 20-6 (9-4), while the 10-14 (2-9) Mountaineers limp into The Phog with hope to rack up just their 3rd win of the conference season. The ESPN pregame Match-up Predictor favors KU 93% to 7%, with KU favored by 14 points. • Huggins dismissed 20 points and 10 rebounds per game in senior forward Esa Ahmad and junior guard Wesley Harris for what a school news release termed a "violation of athletic department policies." • WVU G James "Beetle" Bolden (12.2PPG and 82% at the free throw line) is expected to miss the game due to injury. • WVU is vying to become the 2nd team to sweep Kansas in the Bill Self era. • In 105 regular-season Big 12 home & home series, KU has 71 sweeps, 33 splits and ome opponent sweep, by OSU in 2017-18. • F Dedric Lawson has posted a league-leading 16 double-doubles this season, which ranks fifth nationally. • D. Law leads the Big 12 in scoring at 19.4 ppg and rebounding at 10.6 rpg. • In 45 minutes at TCU, Devon Dotson had his first double-double, with career highs in points (25) and rebounds (10). • Dotson was named the CBS Sports/USBWA National Freshman of the Week on Feb. 12. 7:00 PM CT on ESPN our beloved Jayhawks (20-6, 9-4) sojourn to Lubbock in search of another elusive road win (currently just 2-6 in true road games this season, 2-4 in conference) and a season sweep against the Red Raiders (21-5, 9-4) (which would be just their second sweep of this season, TCU being the first). Tech looks to defend home court United Supermarkets Arena (15,098) against our Jayhawks. The winner keeps within striking distance of KSU (defending their home court against OSU earlier in the day) while the loser takes one more step toward elimination from any chance for any piece of the crown. Game voices will be Mark Neely (play-by-play) and Fran Fraschilla (analyst). No word on who will be the courtside reporter. The ESPN pregame Match-up Predictor does not favor KU (27% to 73% for TT), but every game from here on out is must win for both squads, so I'm thinking this is a tossup. • Kansas and Texas Tech have the two longest winning streaks in the Big 12: TT four straight, KU three. • KU and TT are tied for second in the Big 12 race, one game behind KSU (10-3). • Four of the nine other Big 12 teams are within two games of KSU (1: KU, TT; 2: BU, ISU). • Kansas is 6-3 against the current Associated Press top-25 with victories against No. 5 Tennessee, No. 10 Michigan State, No. 11 Marquette, No. 14 Texas Tech, No. 17 Villanova and No. 19 Iowa State. • This contest comes after six days off for both teams. • Under Bill Self, Kansas is 70-9 (.886) in games following five or more days off, the best such record in NCAA DI since 2003-04. 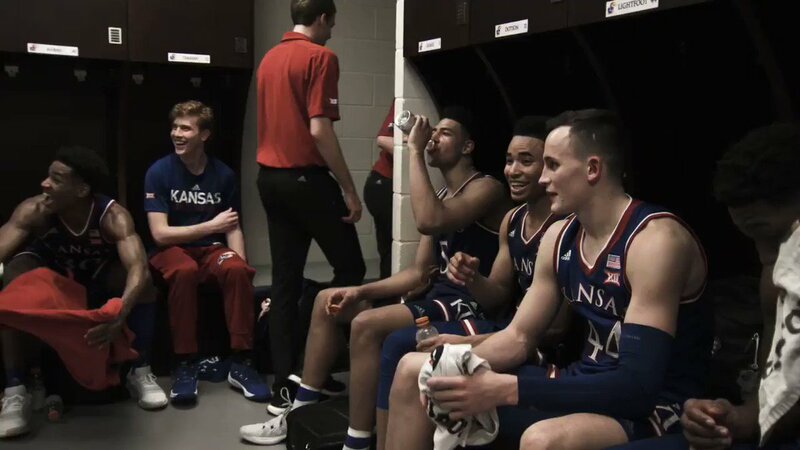 • With its 78-53 win against West Virginia (2/16), Kansas won its 20th game for the 30th-consecutive season, the longest active streak in NCAA Division I and one shy of the all-time DI record. in scoring and rebounding in the same season was Blake Griffin of Oklahoma in 2008-09. National Freshman of the Week on Feb. 12, Dotson averages 12.2 ppg, 3.8 rpg, 3.7 assists and 1.5 steals in all games. • Marcus Garrett will be in uniform for the game. Whether he plays or not will be a Coach's Decision as the game progresses. SB Nation blogtalkradio.com: The Air Raid Podcast #160: Texas Tech basketball v Kansas and Culver mocked #2? The KU team that played tonight will not beat KSU on Monday. 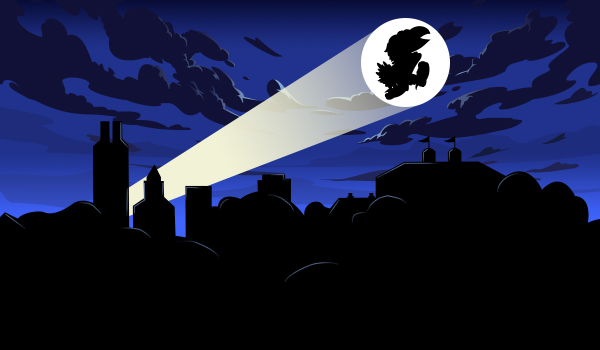 Which Jayhawks squad will make an appearance in the Phog in two days? 8:00 PM CT on ESPN our beloved Jayhawks (20-7, 9-5) host the Wildcats in the Phog, looking to keep their Big XII title hopes alive (even if by the slimmest of threads), to keep their AFH record spotless this season and to avoid a season sweep by KSU. Game voices will be Bob Wischusen (play-by-play), Jay Bilas (analyst - yay! ), and Holly Rowe (Yahoo!) as our intrepid courtside reporter. The ESPN pregame Match-up Predictor favors KU (71% to 29% for KSU), KU by 3,5. • KU (9-5) is tied with BU for 3rd, two games behind KSU (11-3) and one behind TT (10-4) with just four games left. • KU lost its last game at KSU, but has won eight of the last nine match-ups and 12 straight in AFH (last KSU win was 2006). • KU and KSU have met in a location other than Lawrence, Manhattan, or Kansas City on just two occasions. KU beat KSU 71-58 in the 1988 NCAA Elite Eight in Pontiac, MI, and KU won a 67–61 decision over KSU in OKC en route to the 2007 Big 12 Tournament title. • Since Feb. 12, 1994, Kansas has won 57 of the last 63 meetings with KSU. • Kansas’ 196 wins against Kansas State are the most for any team against an opponent in NCAA DI history. • Kansas is 90-12 following a loss in the Bill Self era, including 5-1 this season. • Since the 2013-14 season, KU is now 40-4 following a loss. • Since the inception of the Big 12 in 1996-97, Kansas is 67-18 all-time on ESPN Big Monday (38-1 at home and 29-17 on the road), including 49-12 under head coach Bill Self (28-0 at home and 21-12 on the road). • KU has won 32-straight Big Monday games in AFH. • KU is two wins shy of having a perfect record in the Phog this season, a feat last accomplished in AY2015-16. • The Feb. 25 contest against KSU will be the 900th men’s basketball game played in the Phog (includes regular-season and postseason games, e.g., first round contests of the Big Eight Tournament). • At 9-5, Kansas is vying to win its 10th conference game for the 25th consecutive season, a run which started in 1995 and is the longest active streak in the nation. • Redshirt-junior F Dedric Lawson leads the Big 12 in scoring at 19.0 ppg, rebounding at 10.1 rpg and double-doubles with 16. The last conference player to lead the league in scoring and rebounding in the same season was OU's Blake Griffin (2008-09). KU Athletics: Dillons Sunflower Showdown heads to Allen Fieldhouse Monday (NB: I challenge the KU Athletics lead-in sentence statement that this 291st meeting between KU and KSU is the 291st Dillons' Sunflower Showdown. I have no idea how long Dillons has been the major sponsor of the match-up, but I doubt that Dillons has been the major sponsor since their very first meeting in 1907, and Dillons was not the major sponsor of either their 1988 NCAA Elite Eight matchup or their 2007 Big XII Tournament matchup, the latter having Phillips 66 as the major sponsor, as all of us here know). HE - as usual, thanks for the game preview. One note - if you go for a 7pm CT tip, you will be an hour early. Great defensive effort by our guys! Need to play like that every game from here on out. Next up — the raptor trap that is Gallagher-Iba Arena. Self has losing records in just two conference venues — at OSU (4-7) and at WVU (2-5). If the OSU numbers seem odd given that HCBS is in his16th KU season, remember that before the Big XII shrank to 10 teams OSU was in the Big XII South and KU only played them once a season. That's what our friend asteroid hates! Time for another Dawn Patrol from asteroid! 7:00 AM HT (11:00 AM CT) on CBS our beloved Jayhawks (21-7, 10-5) travel to Bal-Chatri Arena (13,611) in Stillwater to attempt to earn just their 3rd conference foe sweep of the season, this time against the 10-18 (3-12) Cowboys as our guys continue their backs to the wall battle to stay afloat in this season's Big XII regular season title race. Saturday's game voices will be Brad Nessler (play-by-play) and Jim Spanarkel (analyst). No word on who will do court-side reporting. The ESPN pregame Match-up Predictor favors KU 84% to 16%, with no spread at post time -- but this is Self's KU against his alma mater in Stillwater, so all bets are off. • With just three games left in the conference season, KU (10-5) is tied with BU for 3rd, one game behind KSU (11-4) and TT. • KU leads the overall series with OSU 115-59. The Hawks are 36-35 in Stillwater, but 34-35 in Bal-Chatri (Gallagher-Iba ) Arena. • Bill Self will be meeting his alma mater for the 33rd time in his head coaching career, the 29th time as KUHC. • A four-year letter winner for the Cowboys from 1982-85, Self is 19-13 against OSU, 18-10 while at Kansas. • Self's expanded KU record against OSU: AFH 10-2, G-IA 4-7, Neutral 4-1. • At 10-5, KU has won 10 conference games for the 25th-consecutive season, a run which started in 1995 and is the longest-active streak in the nation. • For the 22nd time in the 23-year history of the Big 12 KU has clinched one of the top four seeds and a first-round bye in the Big XII tournament. a No. 3 seed twice and a No. 5 seed once (in 2000). • Redshirt-junior F Dedric Lawson leads the Big 12 in scoring at 19.0 ppg, rebounding at 10.3 rpg and double-doubles with 17, which ranks ninth nationally. The last conference player to lead the league in scoring and rebounding in the same season was OU's Blake Griffin (2008-09). With a Little Help From My Friends by the Beatles! Rock On, Lads! Beat the Sooners in Norman! Had a late start that led to a busy day, my apologies for the late posting. 8:00 PM CT on ESPN2 our beloved Jayhawks (22-7, 11-5) vie to stay one game behind the leaders as they face the OU Sooners in Lloyd Noble Center (11,562). Yet another game where they must win to even have a chance of a tie, but will still need help to make it happen. Lose tonight or lose Saturday hosting Baylor, KSU win Saturday or TT win Saturday, and the streak is officially over. OU hopes to be the team to put that final nail in the coffin of the reigning Champions. Game voices will be Jon Sciambi (play-by-play), Fran Fraschilla (analyst), and no word on our courtside reporter (Holly, please? Our good luck lady!). The ESPN pregame Match-up Predictor barely favors KU (54% to 46% for KU), and the practically toss-up nature of this game shows again in the 1.5 point spread favoring KU by the slimmest of margins. • For the 22nd time in the 23-year history of the Big 12, Kansas has clinched one of the top four seeds and a first-round bye in the upcoming conference tournament. • In 22 Big 12 Championship Tournaments KU has been a No. 1 seed 15 times (including each of the last 10 years), a No. 2 seed four times, a No. 3 seed twice and a No. 5 seed once (in 2000). • KU lost its last game at OU, but has won six of the last seven match-ups overall starting with the 2015-16 season. • Since Feb. 12, 1993, the last time OU won in Lawrence, Kansas has won 31 of the last 40 meetings with OU, going 12-0 in AFH under Self and 17-0 in AFH since that February 1993 game). Regarding this fact/statistic, HE, wouldn't the Jayhawks have been a #1 seed 14 times over the past 14 years...or did we tie for the conference crown and were 2nd in the tiebreaker? Nope. Tied OU in 2005, OU seeded 1, neither made the title game (OSU beat TT). In 2006 and 2008 KU tied with tu for the regular season title, but tu got the 1 seed due to seeding tiebreakers (KU won the B12T title game against them both times). In 2013 KU and KSU tied for 1st, KU seeded 1, KU beat them for the tournament title. Chances of continuing the title streak became minimal with the loss of Udoka. In the 9 games he played KU was 9-0. While he was out for 4 games in December with his ankle injury KU was 3-1, the one being that disturbing loss in Tempe to ASU. When he went out for good with his wrist injury on January 4, KU was 12-1. KU proceeded to go 5-5 over the next 10 games, 5-4 in conference. Then Vick left after the loss in Manhattan, and Self began starting 4 freshmen. Since then KU has been 5-2, the two being the losses in Lubbock and now Norman. Our Jayhawks have looked absymal on the road in those losses, but there is a seed of promise there. On the plus side there are no true road games left. Unfortunately the team as it now exists has yet to play a neutral site game. And our freshmen seem to be hitting the freshman wall, except for Big Dave McCormack, who looks to be finding himself now that he is finally getting playing time. So the odds seem to be stacked against this team going far in the post season. And since from this point on each game is the last in one way or another, just focus on the season finale in AFH. Still lots to play for in that game. Then worry about staying alive to play another day. Good luck to the guys! Last Edit: 1 month 2 weeks ago by HawkErrant. 9:00 AM HT (1:00 PM CT) on ESPN our beloved Jayhawks (22-8, 11-6) host the Baylor Bears (19-11, 10-7). Saturday's game voices will be Dave Flemming (play-by-play) and Fran Fraschilla (analyst). No word on who will do court-side reporting, hope its it's our Holly! The ESPN pregame Match-up Predictor favors KU 80% to 20%, with no spread at post time. Before going into the Fun Facts section I have to submit my apology for an error that I will claim as mine even though the source I relied upon (sports-reference.com) was inaccurate. I should have double checked the info as it did not jibe with what I thought I knew from previous years. The site has had errors in the past, but I did not think this would be one. I went back to check it today because of the KUAD Game Notes talking about the final home game streak starting with Larry Brown. When I looked on sports-reference.com last week it had a W on the line for the last home game of 1983 played against Nebraska. When I checked today it now has an L. Methinks a website coding error was fixed, because I know last week I went back and forth between 1982, 1983 and 1984 checking the W-L status of the last home game of each season before posting anything on the RCB. (I would allow for the possibility of perhaps having flashback hallucinations, but since I never did any psychotropics -- that I know of, and I think I would -- I don't think that is likely.) It's 35 straight, folks, not 36 -- at least not yet, fingers crossed! Sorry for the inaccurate info. • Beginning in 1983-84 under then-head coach Larry Brown, KU has won a mindboggling 35-straight regular-season home finales. • KU leads the overall series with BU 31-5. The Hawks are 12-3 in Waco (all at the Ferrell Center), 16-0 (15-0) in Lawrence (AFH), and 2-2 at neutral sites. KU first played the Bears in Dec 1951 (a KU win in Hoch), and again in Dec 1966 (2-0) before playing their first games as conference mates in Jan 1997 in Waco. KU went 6-0 against Baylor before the Bears won their first game in 2008. Note well: Four of the last five meetings in Lawrence have been decided by 10 points or less. • Kansas is vying to post its 20th undefeated season in The Phog and its first since going 16-0 in the venue in 2015-16. This would be the seventh undefeated record in Allen Fieldhouse in the Bill Self era. • For the 22nd time in the 23-year history of the Big 12, Kansas has clinched one of the top four seeds and a first-round bye in the upcoming conference tournament. Kansas will be the No. 3 seed for the third time in the 23-year history of the event. KU was also the No. 3 seed in 2004 and 1999. Kansas will play No. 6 seed Texas on March 14 at 8 p.m.
• KU has won at least 11 conference games for 25 consecutive seasons, a run which started in 1995 and is the longest active streak in the nation. • Freshman point guard Devon Dotson is one of only three true freshmen in NCAA DI to be averaging at least 12 ppg, 4 apg, and 4 rbg in league play. Mason III won the honor in 2017 as did Danny Manning in 1988. • Lawson leads the Big 12 in scoring at 19.0 ppg, rebounding at 10.5 rpg and double-doubles with 19, which ranks tied for sixth nationally. The last conference player to lead the league in scoring and rebounding in the same season was Blake Griffin of Oklahoma in 2008-09. OP edited for final regular season KU results and the schedule for the first two rounds of the B12T. Keep on Rock Chalkin', Jayhawks!!! 8:00 PM CT on ESPN2, KU (23-8, 12-6) v tu (16-15, 8-10). Our beloved fresh-faced frosh starters begin the first postseason play of their young careers, joining with their more seasoned teammates in The Sprint Center (18,972) to face the desperate-for-a-win-to-have-any-chance-to-Dance horns. Game voices will be Jon Sciambi (play-by-play), Robbie Hummel (who?) (analyst), and Tara Petrolino courtside reporting (have we seen her before?). 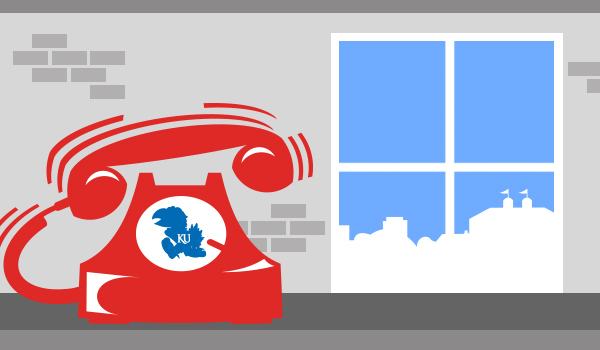 The ESPN pregame Match-up Predictor favors KU 64% to 36%, with a spread of 2.5 points. • Kansas is the No. 3 seed for the Big 12 Championship for the third time (other two were 1999 and 2004). Kansas won the 1999 Big 12 Championship behind Most Outstanding Player Jeff Boshee. In 2004, the Jayhawks lost to Texas in the Big 12 semifinal. • This year ended a 10-year run as No. 1 seed for KU. • In 23 Big 12 Championship Tournaments KU has been a No. 1 seed 15 times, a No. 2 seed four times, a No. 3 seed thrice and a No. 5 seed once (in 2000). • KU leads the overall series with tu 32-9, being 4-1 against them in the B12T (2-0 at the Sprint Center). At KU Bill Self is 22-7 against tu: H 11-1, A: 7-5, N 4-1. • KU won 10 in a row against the Longhorns from AY2013-14 until losing in Austin this year. • Kansas is defending Big 12 tournament champion. KU has won 11 of 22 conference postseason titles since the Big 12 began in 1996-97 and 15 conference postseason tourney titles overall (28 total conference tournament titles counting the old Big 6/7/8 Conference Holiday tournaments). • Kansas (11), Iowa State (4), Oklahoma (3) and Oklahoma State (2) are active league members with Big 12 tourney titles. • Since the Big 12’s inception in 1996-97, Kansas 44-11 in the league tournament. KU is 20-3 in its first games, 1-0 in opening-round games,19-3 in the quarterfinals, 13-6 in semifinals and 11-2 in finals. • Three Jayhawks – Dedric Lawson, Devon Dotson and Marcus Garrett – earned Big 12 postseason awards announced March 10. Lawson was a unanimous selection for All-Big 12 First Team, the Big 12 Newcomer of the Year and unanimous selection for the Big 12 All-Newcomer Team. Dotson was All-Big 12 Third Team and a member of the Big 12 All-Freshman Team. Garrett was named to the Big 12 All-Defensive Team. • On March 6, redshirt-junior Dedric Lawson was named one of 10 semifinalists for the Naismith Trophy Player of the Year Award. KU’s Frank Mason III won the honor in 2017 as did Danny Manning in 1988. • During the regular season, Lawson led the Big 12 in scoring at 19.1 ppg, rebounding at 10.6 rpg and double-doubles with 20, which ranks tied for seventh nationally. The last conference player to lead the league in scoring and rebounding in the same season was Blake Griffin of Oklahoma in 2008-09.
sportsday.dallasnews.com: Texas' leading scorer will return against Kansas, but has the Longhorns' NCAA tournament fate already been sealed? sportsday.dallasnews.com: Bracketology - Does Texas still have NCAA hope as Big 12 Tournament looms? Robbie Hummel was a star for Purdue a few years ago. I might have missed it, but don't see that you put up last night's Big 12 results: TCU by 3 over OSU and WVA by 1 over OU. Also, KSU is holding Dean Wade out of the entire Big 12 tourney, so I won't be surprised by a very early exit. Also, Cartier Diarra is back from his broken finger - will be interesting to see how much and how well he plays. 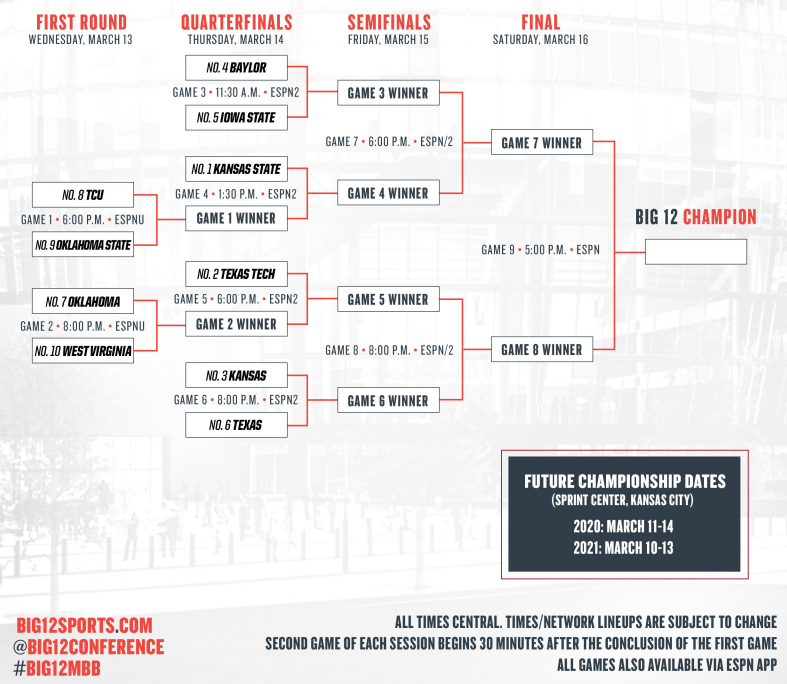 Early this morning I edited the OP for yesterday’s Big 12 tournament games (see the B12T section) but did not make a separate post announcing it. Thanks for the assist, JR! BTW, just before posting this I also updated the OP B12T SCHEDULE & RESULTS section for ISU over BU 83-66.